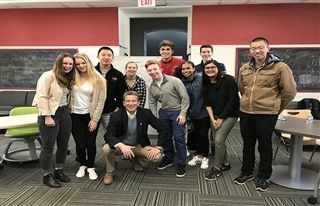 A 25-year veteran Wall Street equity trader, Eric Dobbie, spoke to KO students at a recent Lunch and Lead in the Margaret E. and Henry R. Roberts Center. Now employed at Nutmeg Trucks in Hartford, Dobbie advised the students on navigating the business world and leading a meaningful life. Growing up as a caddie on golf courses, Dobbie learned the ropes of the business world. While on the links, he learned how to "hustle" and make connections. Watching the business executives at leisure led Dobbie to understand the importance of building relationships. He shared key messages with the students to help them weather life’s ups and downs. For starters, he advised them to eliminate the words “can’t” and “no” from their lives and to surround themselves with success- minded individuals who can help them achieve their dreams. Dobbie said it’s important to appreciate the people that you meet in life because you never know if that person can help you fulfill your goals. “Business is an opportunity to build relationships. People will do business with you when they know and trust you,” Dobbie said. Rather than have a limited view of growing a business, Dobbie told the students to grow relationships instead. Dobbie wrote on the whiteboard a formula that came to him in a dream which served to express the key messages that he shared in his talk. 9/11 = represents the day Dobbie lost a number of close friends in the World Trade Center. Due to this tragedy, he never discounts every moment he wakes up in the morning. 3 = three magic words, “I’m just curious.” Ask people open-ended questions to learn more about them. The Margaret E. and Henry R. Roberts Center for Leadership compliments our dynamic academic program by offering multiple opportunities to engage in the powerful learning that happens outside the classroom. As an integral element of our engaged liberal arts program, The Margaret E. and Henry R. Roberts Center for Leadership allows Kingswood Oxford students to fully embark on the understanding of self, others and community as we all grow as leaders. Our students are ready, knowledgeable and prepared to make an impact on our world, locally and globally with empathy and respect.